Dr. Teals and Nature Gate are two brands that most people have heard of. They are both readily available in big name stores. I have actually purchased both in the past and recently reached out to review them. They agreed to send me Natures Gate Baby Wash and Dr.Teals Soothing Bubble Bath. 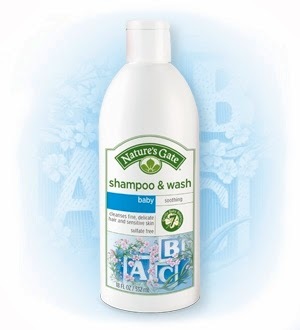 Nature’s Gate Baby Shampoo & Wash gently cleanses, leaving fine textured hair and delicate skin smooth and soft. An array of calming herbs including Sage and Lavender are combined with our nourishing blend of 7 Gentle Baby Botanicals to bathe your baby from head to toe. This mild cleanser is the natural choice for baby-fine hair and sensitive skin. I was a little concerned about Natures Gate baby wash, because my little man has eczema and many of the bigger names in baby washes flare his rash. To my surprise, Natures Gate did not do that at all! It has a light scent to it, but is gentle enough to use on my little man. It is a hair/ body wash combo- and it leaves him smelling fresh, looking clean- and leaves his skin unharmed. It lathers really well, and I know the one bottle will last for a long time because it contains 18fl oz. At only around $7.79 it is definitely an affordable option for parents wanting a more natural baby wash. You can purchase this online at natures-gate.com or at wholefood stores! Dr. Teal's® Foaming Bath transforms an ordinary bath into a moisturizing spa experience by combining the natural minerals of epsom salt with luxurious essential oils to soothe the senses, relax tense muscles and provide relief from stress. The Dr. Teals Soothing bath is a favorite of my oldest son and I. The smell is a REAL scent of lavender. Not that fakey, almost lavendery smell- this smells like fresh lavender plucked from the stem. It creates tons of bubbles, just by using a tiny bit- is soothing, and does not bother my skin. It is wonderful for that end if the night bath where you just want to wash all the negativity of the day away. I love that it leaves my skin with a light lavender scent, so I sleep more soundly for the rest of the night. This only cost $5.99 or less and is readily available at Walmart of Target! I am very impressed with both products, and each are incredibly affordable. You are definitely getting a high end product for a low end price! I have purchased Dr. Teal's in the past and will continue to do so, and will definitely be looking for more Nature's Gate Baby Wash for my little guy!